I remember back, it must have been about 2008-2009, I was living in a small city in Canada and I was very busy volunteering in my community church. I was involved in evangelism activities while I taught about what an authentic Christian testimony is (it’s all about LOVE) inside the church on Sunday afternoons. At the time, I felt like I fit in. But… I had a secret. On the outside I looked like the perfect evangelical. I loved to talk about Jesus and openly did so with anyone who was interested, I went to church every Sunday, I tithed, and I prayed. But inside I held radical beliefs about the Holy Spirit (I believe the Spirit is the original image of woman. That’s right the Holy Spirit is not necessarily invisible and She is our Mother). Because of my inner convictions, I often felt like I was living a double life. Fitting in with the church on one side and praying and living a radically different kind of spiritual life on the other. 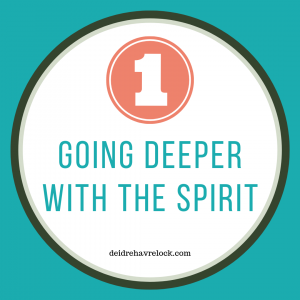 I wasn’t purposefully trying to live a double life, trust me, I desperately wanted to talk about my beliefs about the Spirit. But too often if I did, people would grow angry… How dare I say God is a woman. How dare I suggest the Bible is wrong (FYI, I never suggested that). But thankfully, God gave me a wonderful mentor who guided me through my double-life experience. He was our church’s theologian. And he spent hours with me just listening to my experiences and reading my scraggly teaching notes on the femininity of the Holy Spirit. He encouraged me through a very confusing time in my life. And not once did he condemn me for thinking about the Spirit in feminine terms. In fact, he was happy the revelation was coming to light. At one point, I asked him when he thought I’d be able to speak about the Holy Spirit being our Mother without having mass amounts of people getting angry at me. He said God would let me know. And as that time grew closer, my mentor challenged me to begin speaking about my revelation to close friends. Sometimes people were extremely excited about what I had to say, but back then most people were still apprehensive. 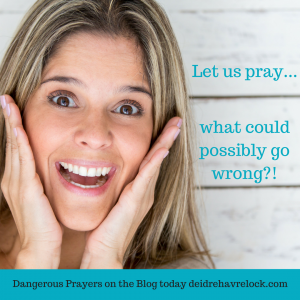 I remember one woman, after I spent the day with her doing “prophetic evangelism” (so much fun! ), we met for dinner and bonded over a three hour meal. Because we had such a strong connection, I decided to tell her about my “special” relationship with the Spirit. She immediately froze and quickly the smile faded from her lips. It was apparent that we were no longer friends. She told me I was “deceived” and then she got up and left never to be heard from again. That one passage put to rest all of my inner grief. 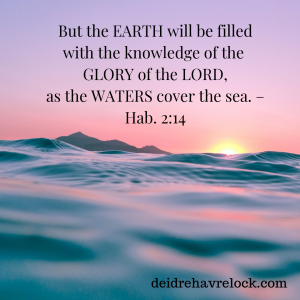 Peace washed over me because the truth of my life is this: I am a disciple of Jesus; I have been trained for a specific purpose, and that purpose has to do with bringing NEW REVELATION to the table so that the body of Christ may grow to completion. This doesn’t mean that loneliness doesn’t still sting me. After all, I definitely (at this point in time) don’t fit in with the church especially now that I’ve bared my soul online about my beliefs. But I do have the inner strength to keep going even when I am lonely. 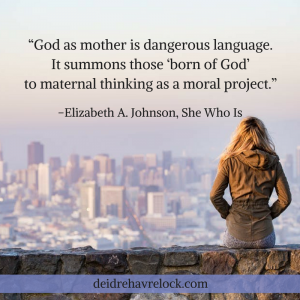 Since I’ve started this blog I’ve gotten many emails from readers who have also been given the revelation of the Spirit as Mother and not surprisingly ALL the emails have this one common thread — loneliness. So for all those disciples of Jesus out there who already know and have experienced the joy of the Holy Spirit as Mother, I want to encourage you to keep going, keep cultivating relationship with the Spirit despite any misunderstandings or backlash you may receive from others. Be forgiving, be bold, be hopeful. And learn everything you can about the Holy Spirit, you may be called to teach what you’ve learned. Deidre, Good article! 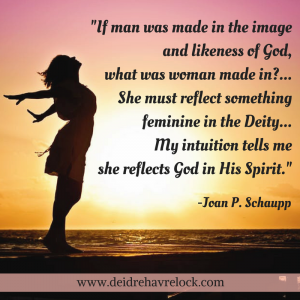 I have searched into understanding the Holy Spirit from a Hebrew perspective, and have found that even the Hebrew scriptures (Old Testament) in some places refer to the Spirit as being “She.” This convinced me more than anything else that the Holy Spirit is in fact a Feminine Being. I also read that Count Zinzendorf, founder of the Moravians, also believed the Holy Spirit was in fact Mother. Yes, those who believe in the Feminine Spirit may feel that loneliness, but we are not alone in our belief. Neither are you! Good article! Thanks Steve, I appreciate the support!